This is a photograph of John T. Taylor, who was born in Cincinnati, Ohio on August 7, 1841, the son of William H. H. and Anna Tuttle (Harrison) Taylor. 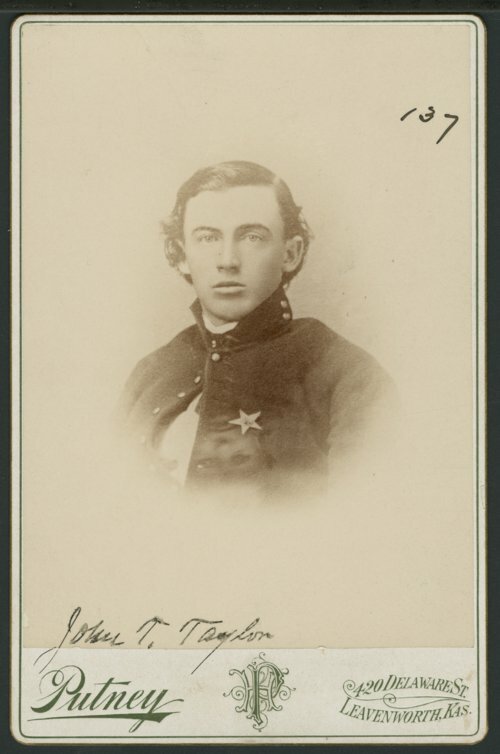 On August 7, 1861, John T. Taylor enlisted as a private in Company G, Fifth Ohio Cavalry, and subsequently, was elected First Lieutenant. At Paducah, Kentucky, he was appointed aide-de-camp to General William T. Sherman, and his first important battle was Shiloh. He was severely injured at Vicksburg. Taylor was discharged in May, 1865, at Charleston, South Carolina, and returned to Ohio. In 1866, he came to Kansas where was engaged in farming and real estate, buying and selling land. Later, he accepted a position as a traveling salesman, which he worked at for twenty-one years. When D. R. Anthony became mayor of Leavenworth he appointed Taylor chief of the police force, and he held that office for many years. In 1881, Taylor married Amelia M. Wilson. He was a member of several organizations including the Grand Army of the Republic and the Military Order of the Loyal Legion.